High-rise building construction throughout Manhattan is an everyday occurrence and seldom only a few stories high. CALLAHEAD’s OVER HEAD CABLE HOIST ensures no matter how many floors your building construction site; workers can have portable toilets conveniently at their disposal. 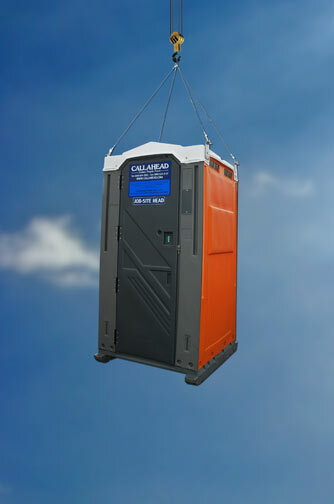 CALLAHEAD’s porta potties delivered with our OVER HEAD CABLE HOIST will provide your high-rise building or skyscraper construction site convenient and sanitary portable toilet facilities. Buildings without elevators or stairways, can even receive the best portable toilet rentals in the portable sanitation industry no matter how tall the building. The OVER HEAD CABLE HOIST is also valuable to other hard to reach locations that are widespread throughout all of New York City’s five boroughs, Nassau and Suffolk Counties and Westchester County. Common construction jobs the OVER HEAD CABLE HOIST is essential include, tunnel construction, bridge construction, train construction, sewer construction, underwater construction, overpass construction, barge construction and ship construction job sites. It is the perfect resolution when a job site needs a portable toilet to be dropped below ground level, lifted above ground level or even taken across the water to a barge or ship. 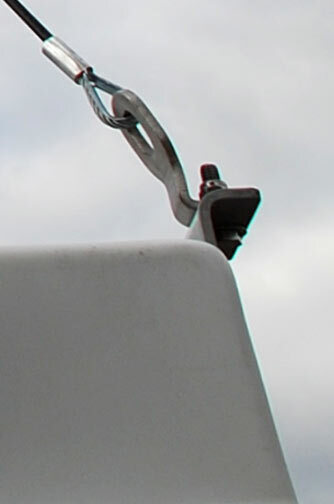 The OVER HEAD CABLE HOIST attaches to our standard size port o potty and is securely lifted by a crane and transported to any floor of a building, lowered below ground level or lifted across the water or other remote location. The crane lifts the port a potty similar as it would any other piece of construction equipment at the jobsite. The OVER HEAD CABLE HOIST has been specifically designed for the portable sanitation industry to lift portable toilets safely to where the toilet needs to be. The OVER HEAD CABLE HOIST provides building, bridge, barge, below ground or other remote construction sites a standard size porta potty for its workers. Placing a portable toilet in close proximity to where construction work is being done, is convenient for the worker, while also being very cost effective to the employer. 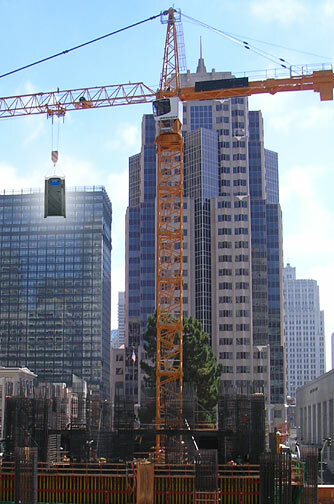 The OVER HEAD CABLE HOIST will eliminate the need for employees, such as those in a high rise building construction, from taking valuable work time to travel down to the ground level to use the portable toilet. In a high rise building without working elevators, it can mean substantial work time away from the job just to travel to the ground level and back. Workers will also appreciate having clean restrooms conveniently available. They will have plenty of room to maneuver inside the portable toilet even when wearing bulky tools, clothing and equipment. In addition, construction workers will appreciate the privacy offered in a full sized porta potty that is completely enclosed, has a lockable door and occupancy sign. 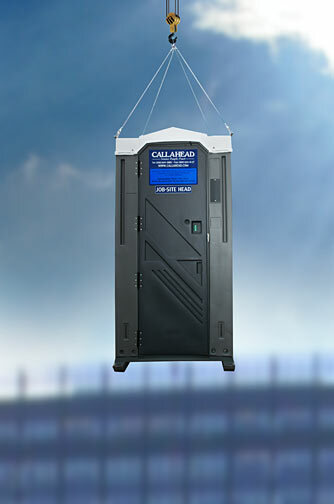 Best of all, the OVER HEAD CABLE HOIST will give your construction site workers in remote working locations the CALLAHEAD brand of port a potties. CALLAHEAD has been servicing New York’s construction and contracting jobsites since 1977. Our decades of experience delivering, servicing and removing portable sanitation equipment from high-rise building construction and other remote locations, made us experts in the field. 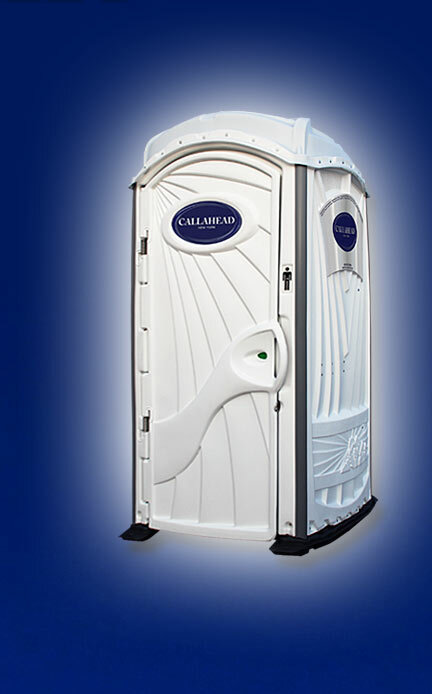 Only CALLAHEAD supplies like new port o potties with a cleaning service that is guaranteed. Our trained uniformed delivery and service technicians arrive at every jobsite in reliable, brand new and shiny clean delivery and service trucks. Our service technicians clean every portable toilet with hospital grade sanitizing cleaning products and detail your port a potty to look like new at every service. All of CALLAHEAD’s equipment is available for same day delivery throughout New York City’s five boroughs of Manhattan, Bronx, Brooklyn, Queens and Staten Island, Nassau and Suffolk Counties on Long Island and all of Westchester County. 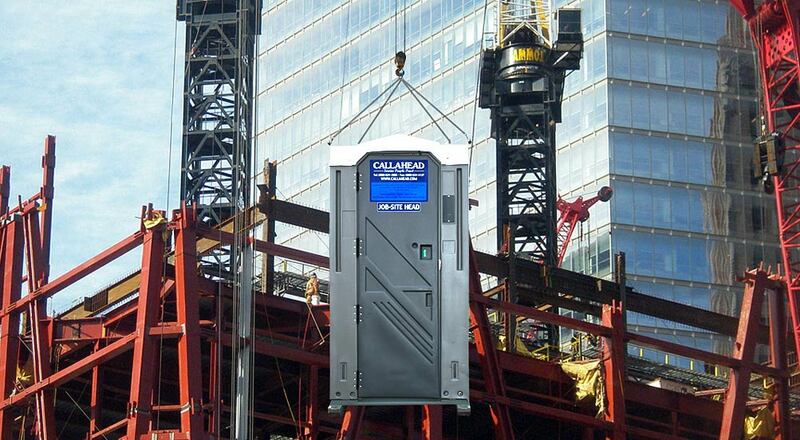 Whether your job site is on the top floor of a skyscraper or across the water on a barge, let CALLAHEAD solve all of your portable toilet needs.